FLIR Systems, Inc. is the world’s largest thermal imaging company. The brand speaks for itself as they produce some of the most advanced thermal imaging solutions. Their products range from handheld thermal cameras to thermal security cameras, thermal scopes, and many others. Sitting right in the middle of single spot infrared thermometers and traditional thermal cameras is FLIR’s TG165. 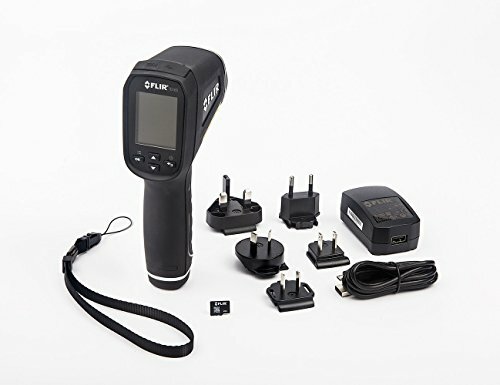 This handheld thermal camera consists of a real-time thermometer and a thermal camera to complete the picture. Thus; its only purpose is to identify cold and hot spots and take thermal images allowing you to detect problems quickly. The TG165 is a sophisticated device that uses two laser pointers to project an image on the area you are viewing. It can measure temperatures as close as 4 inches with a temperature range of -130F to 7160F. With such a wide temperature range, there’s no place you can’t use TG165 from your home to the car and even areas with extreme temperatures such as industrial equipment. The spot thermal imaging camera uses a Lepton IR Imaging Engine with an 80 x 60 pixels resolution. It is capable of rendering powerful images with crisp, clear details for quick examination. This means determing the root cause of issues will be easy and you or your clients can know the location of air leaks and insulation loss in time for repairs. The two laser pointers are useful when it comes to complex objects like switches and circuit boxes. Instead of opening them and risking short circuits, its 24:1 spot size ratio lets you point the thermal camera and see what’s behind the circuit box or wall from a safe distance. The TG165 has a 9Hz refresh rate. It comes in handy when moving your hand so that you will not get choppy images a marred picture although you will need to move slowly. It is also focus-free so no messing with lens rings for focusing. This budget thermal camera boasts a 50-degree field of view. When you have a wide area to cover, all it takes is one scan, and you can have a large image of the area an instant. Say you are scanning a wall or ceiling; you won’t be passing the camera twice when you want one picture that shows all thr information about an object. You will appreciate that the FLIR has used a TFT color screen to display the thermal images. It has three color palettes including iron, gray, and rainbow. If you are looking to see different aspects of an image, changing the color palettes will tell you more about the image. The TG165 is very straightforward to control. You do not need any training, so you only need to familiarize yourself with the controls and start enjoying the view from the thermal camera. It has one large trigger at the center of the handle, so you can use it with one hand. It is ergonomic allowing for use for a long time without fatigue. The other four buttons include the power-back, two arrow keys, and a menu-OK button. It is easy to start using this thermal camera right out of the box. The TG165 has an SD card slot. You can save up to 8000 images on the included 8GB SD card. This is more than enough for most applications. But if you need more space, you can always install a bigger SD card up to 32GB. To transfer your images from the SD card you will need a USB cable which is included. One of the appealing qualities of this device is the rugged construction. It has a robust body that can withstand a 2-meter drop. It can be used around hard floors where you will not be worried when it hits the floor a couple of times. You can use the TG165 with the included lanyard as well, so it can stay around your wrist. It can also be mounted on a tripod thanks to the tripod mount. And when it is time to leave the work site, the thermal camera will stow easily in a toolbox without risking damage to the screen or the exterior surface. A rechargeable 3.7V Lithium-Ion battery powers TG165. The battery charges using a USB cable from an AC power source or USB power from a computer. The device will show different icons for the two different power sources. This device has a running time of five hours during continuous use. To save on the power, the device can power off automatically by selecting a time period on the menu. It can be 1, 2, 5, or 10 minutes of inactivity. 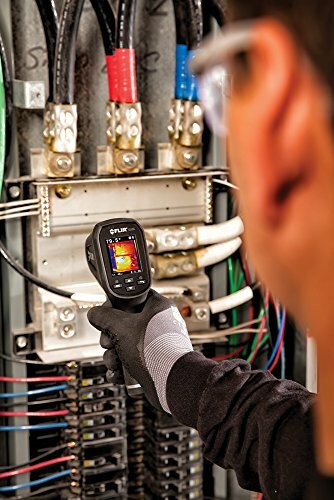 This FLIR imager is useful in HVAC troubleshooting. 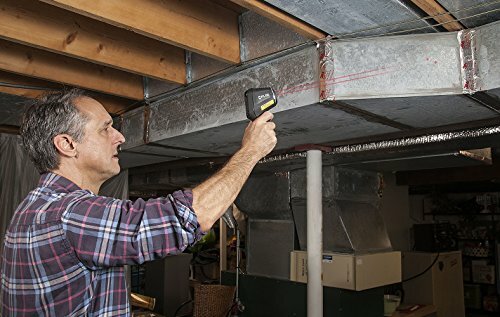 When you want to know when to begin repairs and explain your reasons, this camera will help to identify air leaks, electrical shorts, water leaks, etc. You will also see whether your repairs worked or not. Thus, present credible evidence to your clients. And when you have the confidence of clients, you can get more work and expand your business. Doing a thorough inspection of an automobile means identifying things like hot spots because of electrical connection issues and irregular friction as well as malfunctions in heated seats and mechanical misalignments. The results allow you to make the needed repairs in time. The FLIR TG165 will also come handy in building, electrical, and industrial applications. 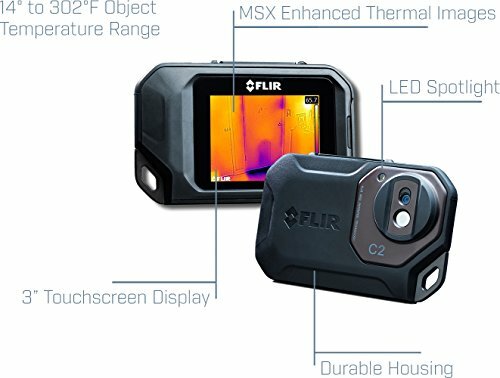 The FLIR C2 is a compact pocket-sized thermal imaging camera. It is fully radiometric, and it incorporates MSX technology. This means it can capture more details in an image since it combines the features of a visual photo on a thermal image so that you can see both images as one. It gives you more details in one picture than you could ever get with only a thermal image. 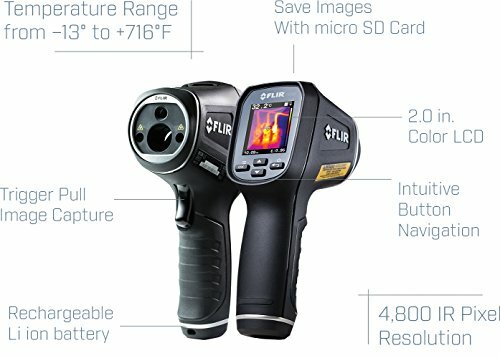 The FLIR C2 has a larger screen which is a 3-inch touchscreen while TG165 has a 2-inch display. Not to mention, you can transfer radiometric images from the C2 onto the FLIR Tools Software for analysis. But C2 has a smaller temperature measurement range from 140F to 3020F compared to TG165 which has a temp range of -130F to 7160F. 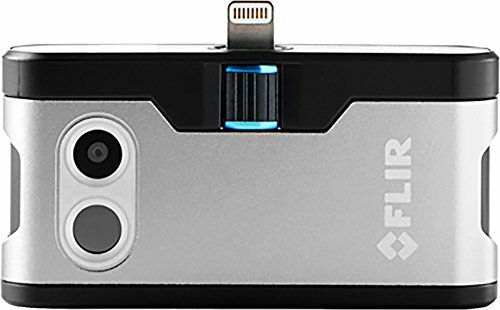 The FLIR ONE transforms your iOS or Android smartphone into a thermal imager. It has a higher thermal image resolution sensor of 160 x 120 pixels. While both the TG165 and FLIR ONE have a 9Hz refresh rate, TG165 has a temperature range of 130F to 7160F and the FLIR ONE has a range of -40F to 2480F. The FLIR ONE has MSX thermal imaging technology where a visual image is embedded within a thermal image to give more information about an area. It becomes much easier to identify a problem with the FLIR ONE than with a TG165. But the storage, display, and battery life of a FLIR ONE depends on your device. This can be an advantage or disadvantage especially if your device cannot hold a charge for long. While the TG165 has a 50-degree field of view, the TG167 has a 25-degree field of view. 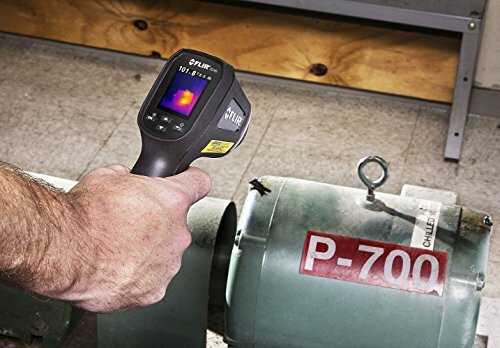 This major difference makes the TG165 applicable in outdoor and some industrial applications while the FLIR TG167 is ideal for indoor applications like electrical inspections. The two thermal cameras have a similar form factor and a rugged design including withstanding a 2-meter drop. They both use a Lepton thermal imager, and they share the same IR resolution. Both models also have the same temperature range. 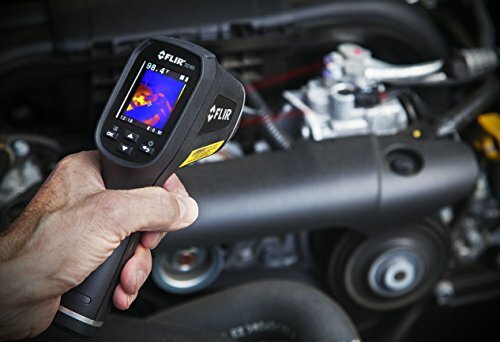 The FLIR TG165 and Fluke VT04 are spot thermal imaging cameras both used for inspection purposes. 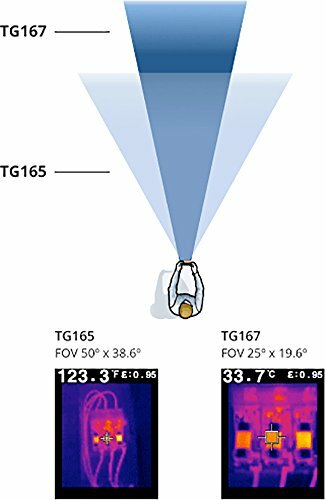 But the TG165 proves to be a more capable device since it has a higher thermal resolution and it can work over a wide temperature range. 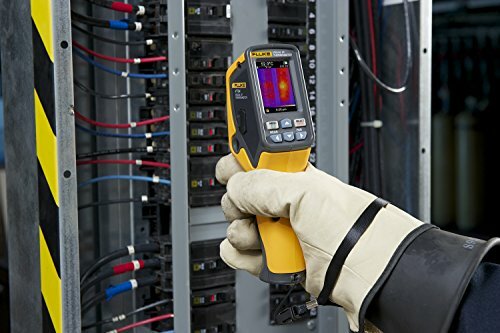 The Fluke VT04 shows hot and cold spots from -140to 4820F. It can blend thermal images with a visual photo at specific increments of 0%, 25%, 50%, and 75% of the visual image. The Fluke VT04 has a smaller field of view at only 28 degrees wide. This feature makes a world of difference since you can use the TG165 to look at wide areas while the Fluke VT04 cannot give a very informational image when used outside or in industrial applications. You may also notice that the accuracy levels between the two thermal imagers vary since the TG165 has a thermal accuracy of +/- 1.50C while the Fluke VT04 manages a 20C thermal accuracy. Both thermal imagers do not create radiometric images, for that, you will need a thermal camera like FLIR C2 or FLIR ONE Pro. If affordability is a deciding factor when selecting a thermal imager, the FLIR TG165 is an excellent pick. It can be used outdoors and indoors thanks to the wide field of view. It also renders images with the necessary details that make it an outstanding thermal imaging camera when your on a budget.